Embroidery is a fine art. In order to create a beautiful finished product, you need the right tools, including the right thread. 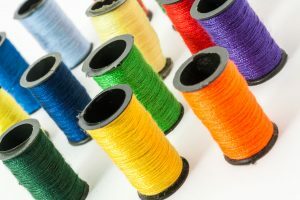 Thread comes in a variety of weights, colors, levels of elasticity and price points. Rayon thread is the most popular choice because it’s easy to use, widely available and has an attractive sheen. It has a soft finish, making it a great choice for everyday apparel. Polyester is similar to rayon in that it’s economical and easy to work with. It has slightly less sheen than rayon, but it’s great for children’s clothing or sports uniforms because it won’t fade, shrink or bleed. Cotton is the most economical choice, but it has several disadvantages. Cotton thread is not as vibrant or shiny as other types of thread, and it will fade in the sun. Moreover, it doesn’t have elasticity, meaning that it will break or fray when pulled. Silk is beautiful, but it’s expensive and difficult to care for. Because it’s high maintenance and costly, it may not be the best choice for commercial embroidery projects but it’s great for special-occasion pieces. Now you know all about the different embroidery threads, but you can still take out the guesswork by leaving embroidery projects to a pro. If you’re interested in creating custom-embroidered apparel or accessories at prices you can afford, check out Barb’s Custom Embroidery. If we can punch a hole in it, we can embroider it! Contact us to get your quote today!